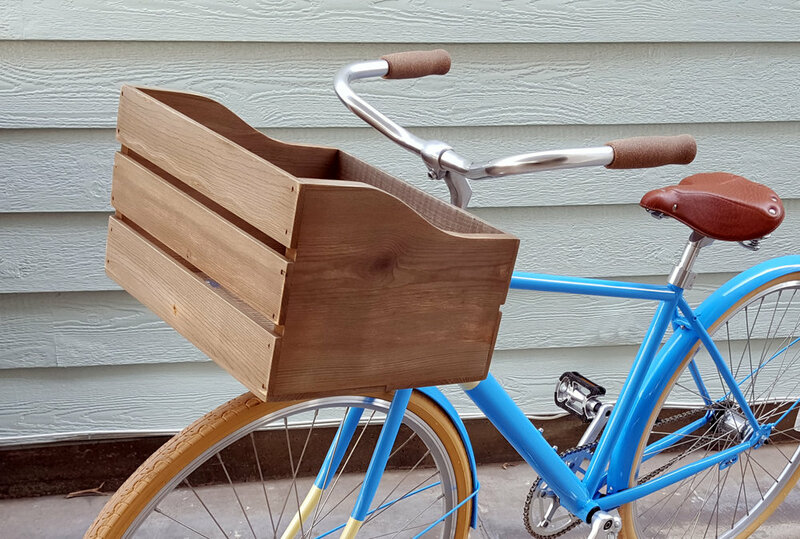 Smart Basket™ is a better type of front bike basket. It carries all your stuff without affecting steering balance and lets you choose from a variety of basket and crate styles. So you can look good while you’re having more fun and getting things done on your bike. Do you want to carry your things on your bike, but you still want your bike to have that certain style? Our support system creates a platform where many different styles of baskets and crates can be mounted. Custom wood crates, curved wire baskets, vintage wine crates, and more are available to carry your cargo in style. Have you wanted to use your bike for a quick trip to the store, but were concerned about balancing those heavy groceries and getting them home? With the supports attached to the bike’s frame instead of the handlebars and fork, the basket and cargo stay steady and don't turn back and forth with the front wheel. Your steering and balance are not affected, and this gives you a stable ride even with heavy cargo. Smart Basket™ can carry loads up to 50 pounds unlike traditional front baskets that are limited to 10 or 15 pounds. The combination of the over-built steel construction and frame mounting lets you haul it all. A case of bottled “root beer” weighs about 35 pounds - no problem! Whatever you carry, it won't affect the bike’s steering, so you’ll have balance and confidence, and that means a safer ride. You'll have more control of your bike when you don’t carry a bag in your hand or your books on your back. Plus, you can keep an eye on your stuff or your dog without having to look back at a rear rack. If your dog likes going on rides, your dog will love riding in a Smart Basket. Your furry friend won't be wagged back and forth with the bike’s steering and will have a steady view (and sniff) of the world going by. Even a 50 pound bull dog can go for a ride! Students who ride their bike to school can get that overweight pack off their back and let the bike's frame carry it. And it works great around college campuses where parking is at a premium. Our smallest basket is designed to carry two full standard grocery bags, so you can do neighborhood shopping and errands in a fun, eco friendly, way with no parking hassles. Fits most beach cruiser style bikes and traditional casual bikes. Make sure to check-out our compatibility information page where you will also find size measurements and example bikes in a fit list.